Yesterday I roasted a rolled loin of lamb and some new potatoes and a little pumpkin and I rustled up this yummy salad to go with it. It was so delicious that I’d thought I’d share the recipe with you. Scrub the beetroots, rub a little oil on them and roast for 40 minutes at 180C. Turn them every 10 minutes. Check they are done with a sharp knife. While warm, being careful not to burn yourself, peel the skin off and chop off the ends. Cut the beetroots into eighths and place in a bowl. 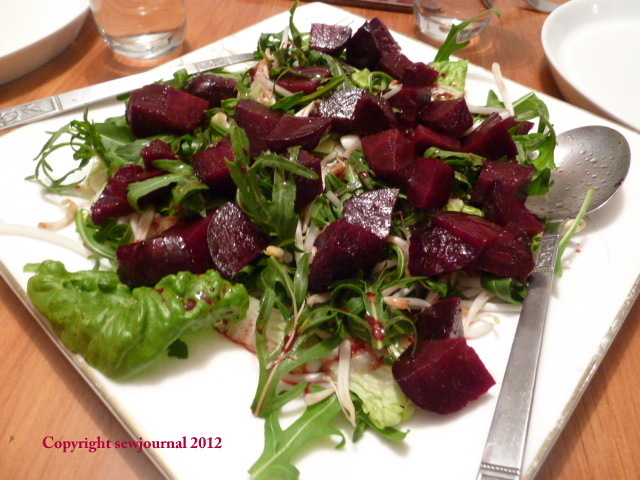 Make the dressing while the beetroots are cooking and pour all of it over the cut, warm beetroot. While the beetroot is marinating wash and drain the rocket, mung bean sprouts and the lettuce. Chop the lettuce. Chop the spring onions. Place the Rocket, lettuce, mung bean sprouts and spring onions on a serving dish and mix up. Then place the beetroot on top and spoon over the rest of the dressing. It’s lovely warm or cold. Add all the ingredients to a small bowl and whisk with a fork until the ingredients are emulsified.